Hello Thayne-san. I’ll be showing you around Chikusen today. It was established in 1842, and is considered one of the foremost makers of yukata and the Edo komon (traditional Tokyo pattern). How was the exhibition the other day? It was great to see part of the process for making Edo komon kimono cloth. I was very impressed. 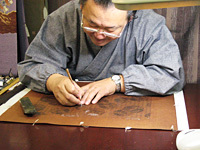 In order to dye something with the detailed Bunkyu komon-type pattern, the design itself is divided into two parts and then two separate stencils have to be hand carved for each part, requiring amazing patience and technique. Watching his knife move over the surface of the paper and carving all those tiny and complex lines almost makes you forget to breathe! Carving out fine patterns with a knife! He’s a pro, of course! When I asked if he always works in silence, I was surprised to hear him say that he always listens to recordings of traditional comedians (rakugo). After the two stencils are finally finished, they are placed one on top of the other―quite a process itself. 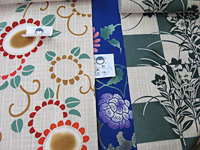 One of the stencils is positioned on the long roll of kimono cloth, and dye is applied. The stencil is then shifted to the next section and the process is repeated until the entire strip is covered. Each blog is perfectly matched for a continuous pattern without a single break. Thayne-san. Hello, I’m Ogawa. Thank you for coming to the exhibition. 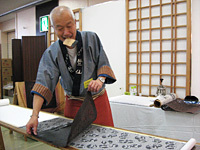 …Both Edo komon and yukata are made by Japanese handwork and are techniques from the Edo Period (1603 to 1868). What type of pattern do you like, Thayne-san? The same process is repeated with the other stencil, making sure the two overlapping patterns match perfectly. Well, a woman might like this kind of pattern. Wow! Beautiful! Were you the one who thought of this motif, Ogawa-san? No, the patterns on yukata such as these are passed down from the Edo Period. But the way we use the patterns today differs from the old tradition. Edo Period yukata usually had several combined elaborate patterns in one garment. The number of people today who understand such beauty has dwindled. So separating patterns into parts and using them in a simple way makes the motif much easier for modern day people to understand. It suits the tastes of modern people. 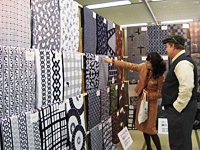 So you rearrange the patterns passed down from your ancestors from the Edo Period? That’s right. Take a look at this, Thayne-san. These are fashion photos from 20 years ago, when people, especially the young, were beginning to forget about traditional yukata. I played around with different ideas, and I decided to stop waiting and hoping that people would someday come back and start appreciating yukata again. I realized that young Japanese are the same as non-Japanese. New yukata concepts were needed and the way we explained yukata also had to change. I decided to do something and when I started talking about what I was doing, people of power and influence got interested, and it ended up changing the direction of the yukata industry! A fashion photo from 1991, created by top-class artists in the fashion industry. The photographer was Noriaki Yokosuka and the stylist was done by Saburo Watanabe. I was surprised by the class of people who wanted to work with us. A mazing! They’re so unconventional. It’s hard to imagine that they’re from 20 years ago–innovative! 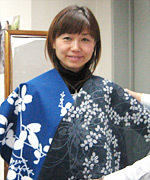 The yukata patterns are modern, as you can see. Nothing’s wasted and it has a refreshing feeling. Nice, isn’t it? But this pattern has been around since the Edo Period. So, you’ve been around since the Edo Period, but your focus isn’t just on preserving the past? That’s right. An old company is one that is always thinking of new things. If it doesn’t, it wouldn’t survive for hundreds of years. Even so, we can’t go too far ahead. We have to look “one and a half steps” into the future. I’m surprised that you can take traditional patterns and rearrange them in modern ways to survive into the future. We’ve survived by always innovating. I see! That’s impressive! By the way, what kind of pattern do you think might suit me? Thayne-san, you mustn’t think only about patterns. “Form” is one way that Japanese and Western clothing are different. Whether you’re heavy, skinny, tall or short, everyone’s yukata comes from a length of cloth sewn together. All yukata have the same form. Since the form is the same, the focus is on the pattern, right? Actually, a kimono changes form depending on the wearer. A heavy person will pull the material tight, but on a skinnier person, the yukata will have creases and folds. With a two-dimensional cloth, no one gets a perfect fit, and that’s what makes the yukata beautiful. The way you wear the yukata will also change the appearance–everything from elegant to tomboyish. But if you don’t know the basics of wearing a kimono, then something will look odd. The ill-fit forms your individuality. The part that doesn’t fit is essential!? It’s all very philosophical. (laughing) With Western clothing, we don’t think that way. Creases becoming individuality… your image changing with the way you wear it… I find that intriguing! Well, I guess that’s about all I have to say. How about actually touching and matching the cloth? The way it looks changes with your skin and hair color. Sure! Let’s let the manager of my school, Sato-san, be the model. Oh, that’s beautiful! I get it now. When you put it on, you can really see what fits. They’re both nice yukata, but the one on the left suits her better, doesn’t it? Right, it brings out her charm. You know, the yukata has many lives. It starts out as a yukata. When it becomes worn, it’s used as a night robe. From there it becomes cloth for use around the house, then baby diapers and finally, cleaning rags. That’s great! All we do with Western clothes is throw them out! We really learned a lot today. Thank you for your time, Ogawa-san!